Socrates: Shall we set down astronomy among the objects of study? Glaucon: I think so, to know something about the seasons, the months and the years is of use for military purposes, as well as for agriculture and for navigation. Socrates: It amuses me to see how afraid you are, lest the common herd of people should accuse you of recommending useless studies. As quoted by Plato. In Richard Garnett, Léon Vallée, Alois Brandl (eds. ), The Universal Anthology: A Collection of the Best Literature (1899), Vol. 4, 111. All that we can do, is to keep steadily in mind that each organic being is striving to increase at a geometrical ratio; that each at some period of its life, during some season of the year, during each generation or at intervals, has to struggle for life, and to suffer great destruction. When we reflect on this struggle, we may console ourselves with the full belief, that the war of nature is not incessant, that no fear is felt, that death is generally prompt, and that the vigorous, the healthy, and the happy survive and multiply. From On the Origin of Species by Means of Natural Selection; or, The Preservation of Favoured Races in the Struggle for Life (1861), 76. And God said, Let there be lights in the firmament of the heavens to separate the day from the night; and let them be for signs and for seasons and for days and years, and let them be lights in the firmament of the heavens to give light upon the earth.” And it was so. And God made the two great lights, the greater light to rule the day, and the lesser light to rule the night; he made the stars also. As soon … as it was observed that the stars retained their relative places, that the times of their rising and setting varied with the seasons, that sun, moon, and planets moved among them in a plane, … then a new order of things began.… Science had begun, and the first triumph of it was the power of foretelling the future; eclipses were perceived to recur in cycles of nineteen years, and philosophers were able to say when an eclipse was to be looked for. The periods of the planets were determined. Theories were invented to account for their eccentricities; and, false as those theories might be, the position of the planets could be calculated with moderate certainty by them. Lecture delivered to the Royal Institution (5 Feb 1864), 'On the Science of History'. Collected in Notices of the Proceedings at the Meetings of the Members of the Royal Institution of Great Britain with Abstracts of the Discourses (1866), Vol. 4, 187. PS The above comments should (help) to reduce your winter heating bill! Jack Roberts' referee's report on Herbert Charles Brown's paper with Rachel Kornblum on the role of steric strain in carbonium ion reactions. As quoted by D. A. Davenport, in 'On the Comparative Unimportance of the Invective Effect', Chemtech (Sep 1987), 17, 530. At a distance in the meadow I hear still, at long intervals, the hurried commencement of the bobolink s strain, the bird just dashing into song, which is as suddenly checked, as it were, by the warder of the seasons, and the strain is left incomplete forever. Like human beings they are inspired to sing only for a short season. (29 Jun 1851). In Henry David Thoreau and Bradford Torrey (ed. ), The Writings of Henry Thoreau: Journal: II: 1850-September 15, 1851 (1906), 275. At the bottom of every leaf-stem is a cradle, and in it is an infant germ; the winds will rock it, the birds will sing to it all summer long, but the next season it will unfold and go alone. In Proverbs from Plymouth Pulpit (1887), 7. But in nothing are swifts more singular than in their early retreat. They retire, as to the main body of them, by the tenth of August, and sometimes a few days sooner: and every straggler invariably withdraws by the twentieth, while their congeners, all of them, stay till the beginning of October; many of them all through that month, and some occasionally to the beginning of November. This early retreat is mysterious and wonderful, since that time is often the sweetest season in the year. But, what is more extraordinary, they begin to retire still earlier in the most southerly parts of Andalusia, where they can be no ways influenced by any defect of heat; or, as one might suppose, defect of food. Are they regulated in their motions with us by failure of food, or by a propensity to moulting, or by a disposition to rest after so rapid a life, or by what? This is one of those incidents in natural history that not only baffles our searches, but almost eludes our guesses! In Letter to Daines Barrington, (28 Sep 1774), in The Natural History and Antiquities of Selborne (1789), 278. Chagrined a little that we have been hitherto able to produce nothing in this way of use to mankind; and the hot weather coming on, when electrical experiments are not so agreeable, it is proposed to put an end to them for this season, somewhat humorously, in a party of pleasure, on the banks of Skuylkil. Spirits, at the same time, are to be fired by a spark sent from side to side through the river, without any other conductor that the water; an experiment which we some time since performed, to the amazement of many. A turkey is to be killed for our dinner by the electrified bottle: when the healths of all the famous electricians in England, Holland, France, and Germany are to be drank in electrified bumpers, under the discharge of guns from the electrical battery. Letter to Peter Collinson, 29 Apr 1749. In I. Bernard Cohen (ed. ), Benjamin Franklin's Experiments (1941), 199-200. Characteristically skeptical of the idea that living things would faithfully follow mathematical formulas, [Robert Harper] seized upon factors in corn which seemed to blend in the hybrid—rather than be represented by plus or minus signs, and put several seasons into throwing doubt upon the concept of immutable hypothetical units of inheritance concocted to account for selected results. In 'Robert Almer Harper', National Academy Biographical Memoirs (1948), 25, 233-234. During seasons of great pestilence men have often believed the prophecies of crazed fanatics, that the end of the world was come. Credulity is always greatest in times of calamity. Prophecies of all sorts are rife on such occasions, and are readily believed, whether for good or evil. From Memoirs of Extraordinary Popular Delusions (1841), Vol. 1, 170. Please respect the colorization artist’s wishes and do not copy this image for ONLINE use anywhere else. 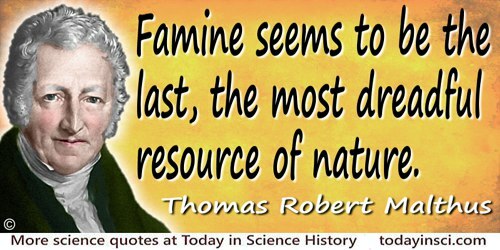 Famine seems to be the last, the most dreadful resource of nature. The power of population is so superior to the power in the earth to produce subsistence for man, that premature death must in some shape or other visit the human race. The vices of mankind are active and able ministers of depopulation. They are the precursors in the great army of destruction; and often finish the dreadful work themselves. But should they fail in this war of extermination, sickly seasons, epidemics, pestilence, and plague, advance in terrific array, and sweep off their thousands and ten thousands. Should success be still incomplete, gigantic inevitable famine stalks in the rear, and with one mighty blow, levels the population with the food of the world. In An Essay on the Principle of Population (1798), 140, and in new enlarged edition (1803), 350. First, by what means it is that a Plant, or any Part of it, comes to Grow, a Seed to put forth a Root and Trunk... How the Aliment by which a Plant is fed, is duly prepared in its several Parts ... How not only their Sizes, but also their Shapes are so exceedingly various ... Then to inquire, What should be the reason of their various Motions; that the Root should descend; that its descent should sometimes be perpendicular, sometimes more level: That the Trunk doth ascend, and that the ascent thereof, as to the space of Time wherein it is made, is of different measures... Further, what may be the Causes as of the Seasons of their Growth; so of the Periods of their Lives; some being Annual, others Biennial, others Perennial ... what manner the Seed is prepared, formed and fitted for Propagation. 'An Idea of a Philosophical History of Plants', in The Anatomy of Plants With an Idea of a Philosophical History of Plants and Several Other Lectures Read Before the Royal Society (1682), 3-4. For the time of making Observations none can ever be amiss; there being no season, nor indeed hardly any place where in some Natural Thing or other does not present it self worthy of Remark: yea there are some things that require Observation all the Year round, as Springs, Rivers, &c. Nor is there any Season amiss for the gathering Natural Things. Bodies of one kind or other presenting themselves at all times, and in Winter as well as Summer. In Brief Instructions for Making Observations in all Parts of the World (1696), 10-11. Geology ... offers always some material for observation. ... [When] spring and summer come round, how easily may the hammer be buckled round the waist, and the student emerge from the dust of town into the joyous air of the country, for a few delightful hours among the rocks. In The Story of a Boulder: or, Gleanings from the Note-book of a Field Geologist (1858), viii. In 'Nuclear Winter: Global Consequences of Multiple Nuclear Explosions', Science (1983), 222, 1290. He, who for an ordinary cause, resigns the fate of his patient to mercury, is a vile enemy to the sick; and, if he is tolerably popular, will, in one successful season, have paved the way for the business of life, for he has enough to do, ever afterward, to stop the mercurial breach of the constitutions of his dilapidated patients. He has thrown himself in fearful proximity to death, and has now to fight him at arm's length as long as the patient maintains a miserable existence. Quoted by William M. Scribner, 'Treatment of Pneumonia and Croup, Once More, Etc,' in The Medical World (1885), 3, 187. HIBERNATE, v. i. To pass the winter season in domestic seclusion. There have been many singular popular notions about the hibernation of various animals. Many believe that the bear hibernates during the whole winter and subsists by mechanically sucking its paws. It is admitted that it comes out of its retirement in the spring so lean that it has to try twice before it can cast a shadow. The Collected Works of Ambrose Bierce (1911), Vol. 7, The Devil's Dictionary, 137. (16 Dec 1837). In Henry David Thoreau and Bradford Torrey (ed. ), The Writings of Henry Thoreau: Journal: I: 1837-1846 (1906), 18. I have always liked horticulturists, people who make their living from orchards and gardens, whose hands are familiar with the feel of the bark, whose eyes are trained to distinguish the different varieties, who have a form memory. Their brains are not forever dealing with vague abstractions; they are satisfied with the romance which the seasons bring with them, and have the patience and fortitude to gamble their lives and fortunes in an industry which requires infinite patience, which raise hopes each spring and too often dashes them to pieces in fall. They are always conscious of sun and wind and rain; must always be alert lest they lose the chance of ploughing at the right moment, pruning at the right time, circumventing the attacks of insects and fungus diseases by quick decision and prompt action. They are manufacturers of a high order, whose business requires not only intelligence of a practical character, but necessitates an instinct for industry which is different from that required by the city dweller always within sight of other people and the sound of their voices. The successful horticulturist spends much time alone among his trees, away from the constant chatter of human beings. Moreover, finding some Truths and not-commonly-believed opinions to arise from my meditations upon these neglected Papers, I proceeded further to consider what benefit the knowledge of the same would bring to the world, ... with some real fruit from those ayrie blossoms. From Natural and Political Observations Mentioned in a Following Index and Made upon Bills of Mortality (1662), Preface. Reproduced in Cornelius Walford, The Insurance Cyclopaedia (1871), Vol. 1, 286-287. If experiments are performed thousands of times at all seasons and in every place without once producing the effects mentioned by your philosophers, poets, and historians, this will mean nothing and we must believe their words rather our own eyes? But what if I find for you a state of the air that has all the conditions you say are required, and still the egg is not cooked nor the lead ball destroyed? Alas! I should be wasting my efforts... for all too prudently you have secured your position by saying that 'there is needed for this effect violent motion, a great quantity of exhalations, a highly attenuated material and whatever else conduces to it.' This 'whatever else' is what beats me, and gives you a blessed harbor, a sanctuary completely secure. 'The Assayer' (1623), trans. Stillman Drake, Discoveries and Opinions of Galileo (1957), 273. If you ask the fish whether they’d rather have an oil spill or a season of fishing, I wouldn’t be surprised if they’d vote for another blowout. As quoted by Mark Bittman in 'What's Worse Than an Oil Spill? ', New York Times (20 Apr 2011), A23. If you look at a tree and think of it as a design assignment, it would be like asking you to make something that makes oxygen, sequesters carbon, fixes nitrogen, distills water, provides habitat for hundreds of species, accrues solar energy’s fuel, makes complex sugars and food, changes colors with the seasons, creates microclimates, and self-replicates. In audio segment, 'William McDonough: Godfather of Green', WNYC, Studio 360 broadcast on NPR radio (18 Mar 2008) and archived on the station website. Let Nature do your bottling and your pickling and preserving. For all Nature is doing her best each moment to make us well. She exists for no other end. Do not resist her. With the least inclination to be well, we should not be sick. Men have discovered—or think they have discovered—the salutariness of a few wild things only, and not of all nature. Why, “nature” is but another name for health, and the seasons are but different states of health. Some men think that they are not well in spring, or summer, or autumn, or winter; it is only because they are not well in them. (23 Aug 1853). In Henry David Thoreau and Bradford Torrey (ed. ), The Writings of Henry Thoreau: Journal: V: March 5-November 30, 1853 (1906), 395. 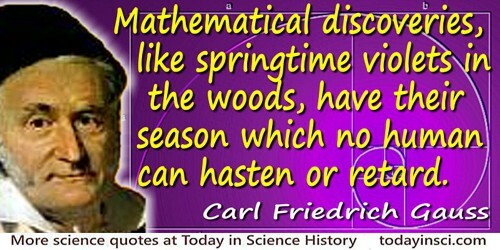 Mathematical discoveries, like springtime violets in the woods, have their season which no human can hasten or retard. Quoted in E.T. Bell, The Development of Mathematics (1945). 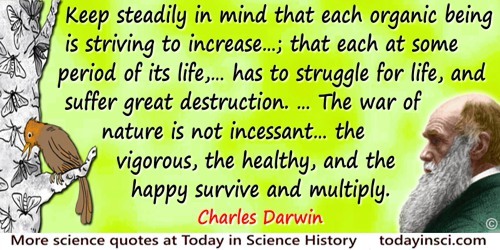 Natural history is a matter of observation; it is a harvest which you gather when and where you find it growing. Birds and squirrels and flowers are not always in season, but philosophy we have always with us. It is a crop which we can grow and reap at all times and in all places and it has its own value and brings its own satisfaction. From Under the Apple-Trees (1916), Preface. Not all the winds, and storms, and earthquakes, and seas, and seasons of the world, have done so much to revolutionize the earth as Man, the power of an endless life, has done since the day he came forth upon it, and received dominion over it. From Sermon on the Power of Endless Life, and Other Sermons (1876), 310. Opening lines of 'Sonnet 14' (1609) in Complete Dramatic Works and Miscellaneous Poems (1823), 776. (1906), 14. Season’d life of man preserv’d and stor’d up in Books. A diligent experiment that was quantitatively correct only as far as it goes. He overlooked the essential role of air and photosynthesis in the growth process. Complex. atque mist. elem. fig., 30, Opp. pp. 104-5; Aufgang, 148. In Walter Pagel, Joan Baptista Van Helmont (2002) , 53. 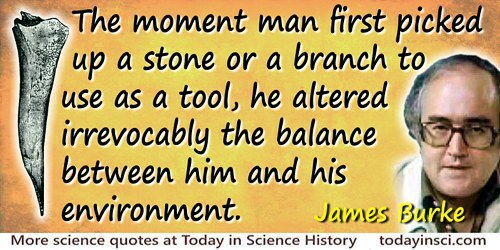 The moment man first picked up a stone or a branch to use as a tool, he altered irrevocably the balance between him and his environment. From this point on, the way in which the world around him changed was different. It was no longer regular or predictable. New objects appeared that were not recognizable as a mutation of something that existed before, and as each one merged it altered the environment not for one season, but for ever. The Moon and its phases gave man his first calendar. Trying to match that calendar with the seasons helped give him mathematics. The usefulness of the calendar helped give rise to the thought of beneficent gods. And with all that the Moon is beautiful, too. Epigraph in Isaac Asimov’s Book of Science and Nature Quotations (1988), 164. The ravages committed by man subvert the relations and destroy the balance which nature had established between her organized and her inorganic creations; and she avenges herself upon the intruder, by letting loose upon her defaced provinces destructive energies hitherto kept in check by organic forces destined to be his best auxiliaries, but which he has unwisely dispersed and driven from the field of action. When the forest is gone, the great reservoir of moisture stored up in its vegetable mould is evaporated, and returns only in deluges of rain to wash away the parched dust into which that mould has been converted. The well-wooded and humid hills are turned to ridges of dry rock, which encumbers the low grounds and chokes the watercourses with its debris, and–except in countries favored with an equable distribution of rain through the seasons, and a moderate and regular inclination of surface–the whole earth, unless rescued by human art from the physical degradation to which it tends, becomes an assemblage of bald mountains, of barren, turfless hills, and of swampy and malarious plains. There are parts of Asia Minor, of Northern Africa, of Greece, and even of Alpine Europe, where the operation of causes set in action by man has brought the face of the earth to a desolation almost as complete as that of the moon; and though, within that brief space of time which we call “the historical period,” they are known to have been covered with luxuriant woods, verdant pastures, and fertile meadows, they are now too far deteriorated to be reclaimable by man, nor can they become again fitted for human use, except through great geological changes, or other mysterious influences or agencies of which we have no present knowledge, and over which we have no prospective control. The earth is fast becoming an unfit home for its noblest inhabitant, and another era of equal human crime and human improvidence, and of like duration with that through which traces of that crime and that improvidence extend, would reduce it to such a condition of impoverished productiveness, of shattered surface, of climatic excess, as to threaten the depravation, barbarism, and perhaps even extinction of the species. Man and Nature, (1864), 42-3. The sun … is a body of great size and power, the ruler, not only of the seasons and of the different climates, but also of the stars themselves and of the heavens. When we consider his operations, we must regard him as the life, or rather the mind of the universe, the chief regulator and the God of nature; he also lends his light to the other stars. He is the most illustrious and excellent, beholding all things and hearing all things. In The Natural History of Pliny (1855), Vol. 1, 20. The sun's rays are the ultimate source of almost every motion which takes place on the surface of the earth. By their heat are produced all winds, and those disturbances in the electric equilibrium of the atmosphere which give rise to the phenomena of terrestrial magnetism. By their vivifying action vegetables are elaborated from inorganic matter, and become in their turn the support of animals and of man, and the sources of those great deposits of dynamical efficiency which are laid up for human use in our coal strata. By them the waters of the sea are made to circulate in vapor through the air, and irrigate the land, producing springs and rivers. By them are produced all disturbances of the chemical equilibrium of the elements of nature which, by a series of compositions and decompositions, give rise to new products, and originate a transfer of materials. Even the slow degradation of the solid constituents of the surface, in which its chief geological changes consist, and their diffusion among the waters of the ocean, are entirely due to the abrasion of the wind, rain, and tides, which latter, however, are only in part the effect of solar influence and the alternate action of the seasons. from Outlines of Astronomy (1849), 237. And her bosom snowy white! In Hyperion: A Romance (1839), Vol. 1, Book 2, 97. The wind makes music in the woods, but the tune changes with the seasons. In 'Why We Should Celebrate Winter Woodland–Not Just the Christmas Tree', The Guardian (12 Dec 2015). Fall in the fresh lap of the crimson rose. A Midsummer Night's Dream (1595-6), II, i. This long run is a misleading guide to current affairs. In the long run we are all dead. Economists set themselves too easy, too useless a task if in tempestuous seasons they can only tell us that when the storm is long past the ocean is flat again. A Tract on Monetary Reform (1923), 80. What signifies Philosophy that does not apply to some Use? May we not learn from hence, that black Clothes are not so fit to wear in a hot Sunny Climate or Season, as white ones; because in such Cloaths the Body is more heated by the Sun when we walk abroad, and are at the same time heated by the Exercise, which double Heat is apt to bring on putrid dangerous Fevers? The Soldiers and Seamen, who must march and labour in the Sun, should in the East or West Indies have an Uniform of white? Letter to Miss Mary Stevenson, 20 Sep 1761. In Albert Henry Smyth (ed. ), The Writings of Benjamin Franklin (1906), Vol. 4, 115. When I arrived in California to join the faculty of the New University which opened in October 1891, it was near the end of the dry season and probably no rain had fallen for three or four months. The bare cracked adobe fields surrounding the new buildings ... offered a decidedly unpromising outlook... A month or two later, however, there was a magical transformation. With the advent of the autumn rains the whole country quickly turned green, and a profusion of liverworts such as I had never seen before appeared on the open ground... I soon realized that right in my own backyard, so to speak, was a wealth of material such as I had never imagined would be my good fortune to encounter. ... Such an invitation to make a comprehensive study of the structure and development of the liverworts could not be resisted; and the next three years were largely devoted to this work which finally resulted in the publication of 'The Mosses and Ferns' in 1895. In The Structure and Development of Mosses and Ferns (Archegoniatae) (1905, 3rd ed. 1918, rev. 1928). Cited in William C. Steere, Obituary, 'Douglas Houghton Campbell', American Bryological and Lichenological Society, The Bryologist (1953), 131. ~~[Misattributed ? ]~~ Mathematical discoveries, like springtime violets in the woods, have their season which no human can hasten or retard. Webmaster believes this quote is likely a misattributed paraphrase. The subject quote is as given in Israel Kleiner, 'Thinking the Unthinkable: The Story of Complex Numbers (with a Moral)', Mathematics Teacher (Oct 1988), 81, No. 7, 590. In Kleiner’s paper, alongside the quote is a citation, thus: “(Kline 1972)?” Notice the appended question mark. The reference at the end of the paper gives: Morris Kline, Mathematical Thought from Ancient to Modern Times (1972), but without page number. Webmaster checked a later edition, Vol. 3 (1990), 861, in which Kline has an epigraph, with different wording about violets, attributed - not to János - but to his father, “Wolfgang Bolyai” (who is also known as Farkas Bolyai). Translator Abe Shenitzer wrote an ambiguous passage in Herbert Meschkowski, NonEuclidean Geometry (1964), 33. In a discussion posted in the NCTM online Math Forum in 1998, Shenitzer clarified that the proper reading is that the “violet talk” is a simile used in advice given by the father to his son. Note that in the passage, János (Johann/John) reports about that advice in narrative form. Thus, one should also note that even in the original language, perhaps the father’s words are not verbatim. See Farkas Bolyai Quotes on another page of this website.